One question that often comes up when making amigurumi, but is never explained within in an actual pattern, except for a “start stuffing” in passing, is how to stuff your creation. It seems simple in concept, stuff the stuffing in, but there are so many things that can go wrong! Sometimes you end up with a lumpy bumpy animal, or one that looks like it has deflated. Or maybe you stuffed your creature so much there is literally stuffing popping out at the seams. I am not a stuffing expert and I am still learning with each new ami I make, but I am going to share with you my current technique for stuffing here, because right now it seems to be working! No matter what technique you use to stuff your amigurumi, the stuffing you use makes a huge difference. I tried a number of different brands before landing on the one I like best, and I suggest you do the same. If you are always frustrated during the stuffing process, it might be the stuffing, not you! Don’t settle when it comes to stuffing – try a variety until you are satisfied. During my trials, I found some stuffing to be too dense, holding its shape a little too well (if I stuck my finger in it the finger dent would remain!! ), while others, though fluffier, clumped more easily (very frustrating). I am currently using the brand found at Canadian Walmart stores: EverSoft (www.eversoft.ca). It is from a company in Toronto, Canada (so is local, yay! ), is made from recycled material and is eco friendly (bonus! ), and since I can get it at Walmart, it is convenient and well priced. I can’t seem to go wrong with this stuff – I LOVE it. While I will show you my stuffing technique below, which works pretty well for even the worst stuffing, if I stray a bit and add this stuffing a little higgledy piggledy, my ami still turns out great. Also, unlike some other stuffing brands, you can reuse this stuffing because it can be easily fluffed back up to its original form after being squished and condensed. I use polyester stuffing because it is convenient and the cost is right, but if you want a more natural material there are other options, such as cotton, corn, hemp, and wool. I have never tried anything but polyester, so I don’t know how the other materials behave, but it doesn’t hurt to experiment and find THE stuffing that is best for you! Put as much stuffing as you can into the piece all at once in one big clump, then add more to the centre of the clump if needed. The key is to only add stuffing in the middle so the outside remains smooth and less lumpy. Put the stuffing in layer by layer, one on top of the other, until the ami is filled. The key for this method is to use fairly thin layers for smoothness and less lumpiness. I have tried both methods, and by far my favourite is option 2. I have used the first method, and it does work pretty well when your ami is one big ball themselves, with no shaping (such as for my Koko the Owl pattern), but doesn’t work so well for all other designs (such as Harry the Moustache). I stuff my amigurumi using thin layers of polyester stuffing layered on top of each other. Each layer is the same size in diameter as the area I am stuffing. For example, if I was stuffing a pointed piece, my layers of stuffing would start off very small in circumference, and then gradually increase in size as I work my way up the widening piece. After each layer I place, I push it down into the piece, pressing on the entire surface area of the layer, but mostly at the edges. I push the back of my fingers (or hand, depending on the size of the piece) down on the layer, with my finger tips at the edge of the piece, and turn the piece as I do this (lifting the hand up and down as I turn), pushing the stuffing down all the way around. I do this for EVERY layer I place. Yes, this process is long and a little tedious, but honestly, it is less frustrating than trying to stuff an amigurumi that always comes out lumpy. By pressing down each layer before adding more, I also get a nice dense filling that is less likely to deflate later. The ami does look a little funny during the whole process, a little bulbous where I have stuffed, but in the end, when it is complete and closed up, it works great! If your amigurumi has little limbs that are part of the main body, such as the legs of my Felix the Elf pattern and Hanna the Squirrel, then stuff the limbs first really well, with many layers, using the method above before you start using large pieces of stuffing for the main body. If you jump to the larger sized layers for the body too soon, the legs won’t be stuffed enough compared to the body. When have you added enough stuffing? Knowing this comes with practice. It depends on your stuffing, your technique, and what you prefer for your finished amigurumi. I like to stuff my amigurumi a lot initially because the stuffing tends to become less dense with time. Even right before closing the last stitch of a piece, I am sticking in more stuffing with a stuffing tool (ie. chopstick) so that it is filled up right to the end, in all corners. So that is how I like to stuff my amigurumi. What about you? Do you have a special technique that works? Would love to hear about it! When working in continuous rounds with amigurumi your piece will inevitably end with a jog: the end of the round will be higher than the beginning of the round, resulting in a step up. (a) Once you have finished crocheting your piece, cut the yarn, leaving about a 6 inch tail (unless specified otherwise). Pull the working loop all the way out, until the end of the yarn has been pulled through the middle of the last stitch. (b) Thread your yarn needle with the yarn tail. Skipping the next stitch (the first stitch of the last round), insert your needle from the inside to the outside into the second stitch. (c) Insert the needle back into the original stitch the yarn tail comes from (the last stitch of the last round), going through the middle of the stitch from top to bottom, bringing your needle to the front of the piece. (d) Pull the yarn tail until the new “stitch” is the same size as the surrounding stitches. Done! Want the yarn tail on the inside of the piece? (a) bring your needle through the second stitch from the outside to the inside of the piece, then (b) bring it through the middle of the stitch the yarn tail comes from, towards the inside of the piece. And that is it! Looks good, doesn’t it! Nice and neat, with no noticeable jog, or step-up. Basically, with this technique you are making a new stitch over top of the first stitch of the last round, replacing it (so you still have the same number of stitches in the last round). 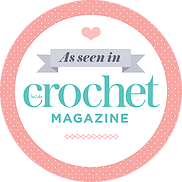 This new stitch can act as any other stitch, so if you are going to be attaching your piece to something else, simply treat it like a normal single crochet. You can also use this same technique to finish joined rounds neatly! Don’t know what joined rounds are? Read my tutorial on the technique first. I like using the invisible finish stitch with joined rounds because it covers up not only the first stitch of the last round (like for continuous rounds above), but ALSO both the last joining slip stitch and chain, creating a more seamless finish at the top of the piece. (a) Do NOT join with a slip stitch at the end of the last round. Instead, cut the yarn and pull the end through the last stitch, just like for continuous rounds above. (b) Thread your yarn needle with the yarn tail. Skipping the slip stitch, chain AND first stitch of the round, insert your needle from the outside to the inside into the second stitch. (c) Insert the needle back into the original stitch the yarn tail comes from (just like for continuous rounds), going through the middle of the stitch from top to bottom, bringing your needle to the inside of the piece. (d) Pull the yarn tail until the new “stitch” is the same size as the surrounding stitches. Just like for continuous rounds, this new “stitch” can act like all the other stitches in the round, replacing the first stitch (so you still have the same number of stitches in the end). If you want “perfect” stripes in your amigurumi, you need to use joined rounds, versus continuous rounds. Don’t know what I am talking about? Read my joined rounds tutorial first before continuing with this tutorial on colour changes! I don’t use any fancy techniques for my stripes. No cutting of the yarn after every round, using a needle, or removing your hook from the working loop to conduct some intricate manoeuvring – and I think my stripes come out really great! I use the simple method of changing colours during the last yarn over of a stitch. Unfamiliar with this method? Read my general colour change tutorial first! Which stitch you change colours in differs, however, when you are working in both loops vs. back loop only (blo), so make sure you choose the method that is appropriate for your pattern. When working in both loops for your amigurumi, change colours at the last yarn over of the last stitch of the round, BEFORE the joining slst. Photos: (a) just before last sc of rnd; (b) just after last sc of rnd, with new colour added during last yarn over; (c) just after joining slst and ch with new colour; (d) result! When working in the blo for your amigurumi, change colours at the starting chain of the round, AFTER the joining slst. Photos: (a) just after the joining slst of previous rnd; (b) making the ch at start of rnd with new colour; (c) just after ch with new colour; (d) result! I really love these simple ways to create great stripes, and I hope you do to!